Attended by the Rt Hon David Willetts MP, UK Minister of State for Universities and Science, the opening of the joint laboratory symbolises the continued commitment by the UK and Singapore to the foster greater synergy and co-operation in moving the frontiers of science. 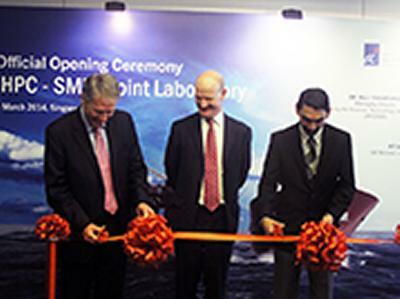 The collaboration draws upon SMMI’s strength in marine research and IHPC's strength in computational modelling and simulation. The strategic aim of the laboratory is to deepen the understanding of the science and technology deployed in the design, construction and operation of future ships used and new offshore structures, which are utilised for the exploration and extraction of oil, gas and renewable energy sources from deep oceans under extreme harsh environments and translate these insights into impactful industrial applications. The laboratory is located on A*STAR premises to promote engagement and more seamless scientific exchanges with researchers from other research fields, such as those from the Singapore Institute of Manufacturing Technology (SIMTech) and the Institute of Materials Research and Engineering (IMRE). The laboratory will undertake projects in collaboration with other partners in the maritime and offshore research and development community, including researchers from National University of Singapore (NUS) and the IHPC-Lloyd’s Register Joint Lab co-located within IHPC premises. Continuing trend in deep-water offshore oil and gas drilling – where the main challenge is in the more complex engineering requirements, both in terms of the environment in which the platforms will operate, and in their design and risk analysis based on more reliable scientific approaches. Growth in shipping – from the increasing size, variety and complexity of ships and a requirement for vessels to be “greener” from an environmental emissions viewpoint.